This was a great article written about AAMEP in 2004, in the years since AAMEP has done some amazing things. Sasha Parker, RN, was burnt out of nursing. After more than 15 years working with plastic surgeons in the specialty of plastic peri-operative nursing, she decided to leave the profession. It was only when she learned of sclerotherapy, a cosmetic procedure to remove spider veins, that Parker decided to combine her nursing skills with her interest in esthetics and become an aesthetic nurse. Today, with society’s ever-growing interest in maintaining a youthful appearance, estheticians are in hot demand. To Parker, it only seems natural for nurses to step into the role. These areas include chemical peels, microdermabrasion, dermal fillers (such as Botox), mesotherapy and sclerotherapy. Recognizing nurses’ need for training, Parker established the Esthetic Skin Institute, in Ft. Lauderdale, Florida, where she trains nursing professionals in these procedures. However, it is once they are trained that Parker believes aesthetic nurses face the most difficult challenges: legislative dysfunction, professional liability issues, insurance coverage, rapidly advancing technology and undefined standards of specialty esthetic nursing practice. 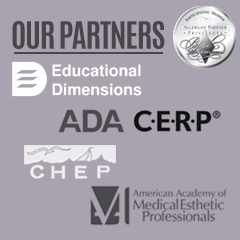 To help combat these issues, in April 2004 Parker formed the Association of Medical Esthetic Nurses, or A.M.E.N., a nonprofit professional organization dedicated to promoting high standards in medical esthetic nursing, and educating and certifying future aesthetic nurses in a rapidly emerging field. “We want to come together as a united force to create some standardization,” Parker said. In the six months since its inception, A.M.E.N. has recorded a victory in at least one state. The Arizona Board of Nursing’s scope of practice committee composed a draft to establish requirements and practice parameters for nurses performing esthetic skin procedures, Parker explained. “Arizona has adopted my policies and I am helping them write standards,” she said. In 2005, A.M.E.N. held its first meeting, in Ft. Lauderdale. Already several hundred members strong, Parker hoped the meeting would draw more interest in the association from professionals in the field.